Minster's Cody Frericks looks to pass covered by Crestview's Kalen Etzler during a game in Flyin' to the Hoop on Sunday at Trent Arena in Kettering. Minster's Jarod Schulze shoots as Crestview's Javin Etzler and Kalen Etzler defend during a game in Flyin' to the Hoop on Sunday at Trent Arena in Kettering. Minster's Mike Ketner shoots over Crestview's Colton Lautzenheiser during a game in Flyin' to the Hoop on Sunday at Trent Arena in Kettering. Minster’s Jarod Schulze shoots as Crestview’s Javin Etzler during a game in Flyin’ to the Hoop on Sunday at Trent Arena in Kettering. Minster's Trent Roetgerman drives against Crestview's Carson Kreischer during a game in Flyin' to the Hoop on Sunday at Trent Arena in Kettering. Minster’s Cody Frericks looks to shoot over Crestview’s Kalen Etzler during a game in Flyin’ to the Hoop on Sunday at Trent Arena in Kettering. Minster’s Mike Ketner drives against Crestview’s Drew Kline during a game in Flyin’ to the Hoop on Sunday at Trent Arena in Kettering. Minster's Jack Heitbrink shoots as Crestview's Javin Etzler defends during a game in Flyin' to the Hoop on Sunday at Trent Arena in Kettering. 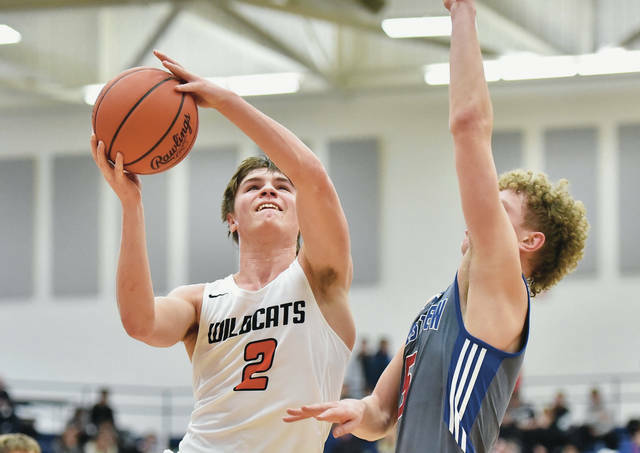 KETTERING — Minster entered a nonconference showdown with Convoy Crestview on Sunday at Flyin’ to the Hoop on a hot streak. The hot streak was no match for Crestview’s hot shooting, though. The Knights made 10 three-pointers and shot 50 percent from the field in a 71-63 victory over the Wildcats at Trent Arena. 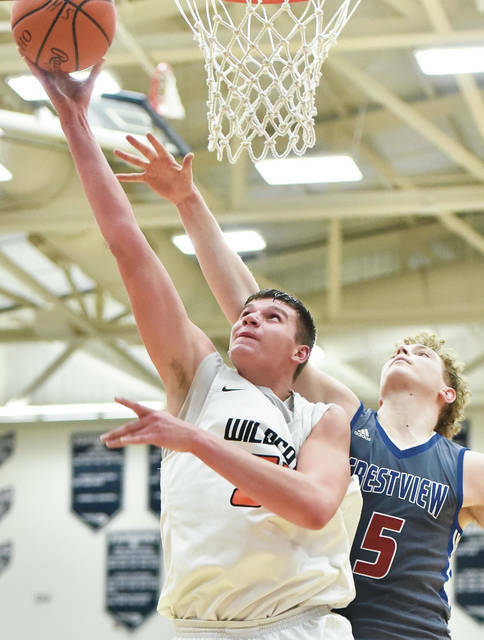 Minster had won six of its last seven games entering Sunday’s contest, including a three-point road win at Midwest Athletic Conference rival and defending Div. IV state champion Marion Local on Friday. 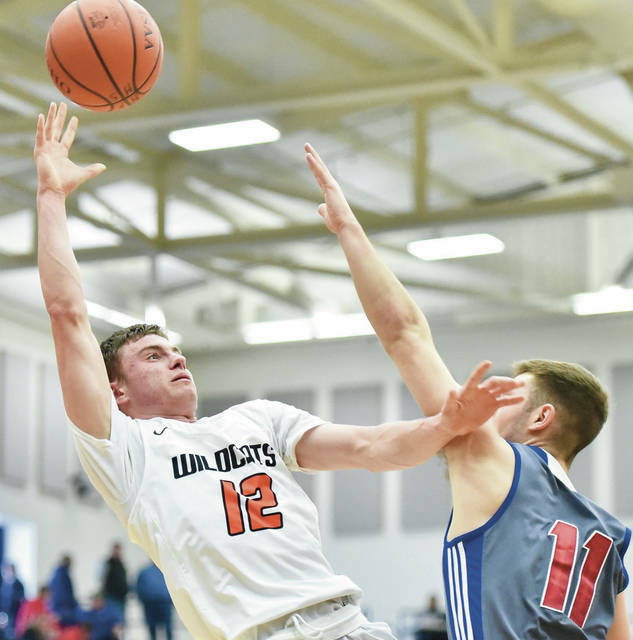 The Wildcats’ lone loss in the stretch was a two-point overtime setback against Fort Loramie on Jan. 12. Crestview’s hot shooting led to things getting out-of-hand early on Sunday. 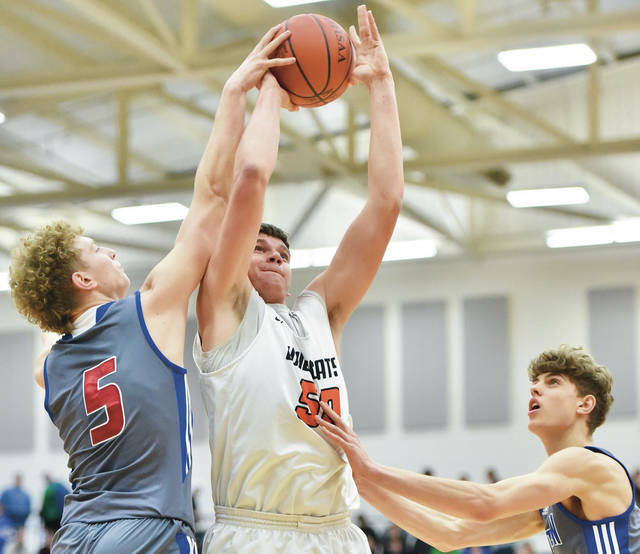 After Jack Heitbrink made a basket with 7:16 left in the second to pull Minster within 17-14, the Knights scored 11 consecutive points (nine of which came on 3-pointers by Kalen and Javin Etzler) to take a 14-point lead. It took the Wildcats (9-4, 3-1 MAC) the rest of the game to cut the gap back down to six points, and that was as close as they could come. Kalen Etzler, a 6-foot-8 forward, led the Knights with 23 points. Javin Etzler, a 6-7 wing guard that has signed with Miami (Ohio), added 20 points. Crestview (11-1, 3-1 Northwest Conference) led 41-19 at halftime, but Minster cut down the deficit in the third by finishing the quarter on a 22-12 run. Cody Frericks made a basket in the paint and Heitbrink followed 15 seconds later with a 3 to cut the gap to 47-32. Heitbrink made a 3 from the left wing to cut the deficit to 12 with 2:16 left, then Justin Nixon made a layup with five seconds left to cut the gap to 55-46. Jarod Schulze made a basket with 6:38 left in the fourth to cut the gap to eight points, but Kalen Etzler followed with a three-pointer 25 seconds later to push the lead to 61-50. Jacob Salazar made a 3 with 2:09 left and a pair of foul shots 20 seconds later to cut the gap to 69-63. But Kalen Etzler made a pair of free throws and to increase the lead to 71-63, and neither team scored in the final minute. Schulze led Minster with 17 points and 10 rebounds. 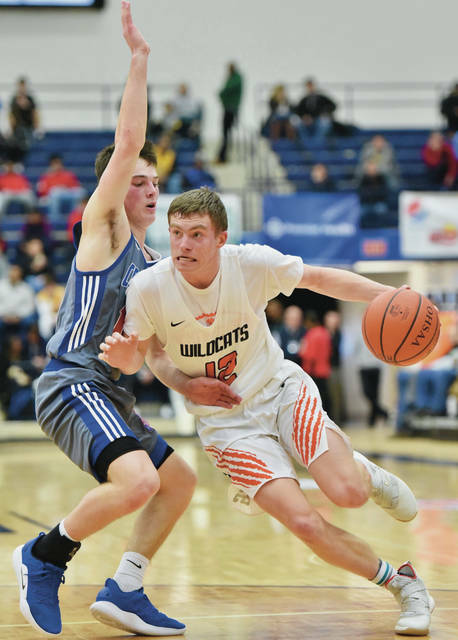 He scored 15 points in the second half, and McClurg said his reemergence helped the Wildcats narrow the deficit. 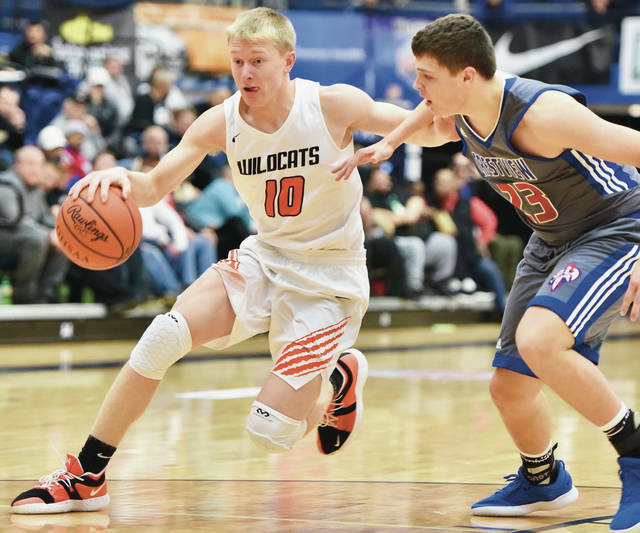 Heitbrink added 16 points for the Wildcats while Ketner finished with 15. Wade Sheets scored 17 points for Crestview. Sheets hit a 3 from the right wing and followed shortly after with a long jumper to give Crestview an 11-4 lead with 5:17 left in the first. After a timeout, Minster regrouped and finished the quarter on a 9-6 run, which was capped by a 3-pointer from Ketner from the top of the key with 20 seconds left. After Heitbrink’s basket to open the second, Crestview called a timeout and then quickly built a 14-point lead. 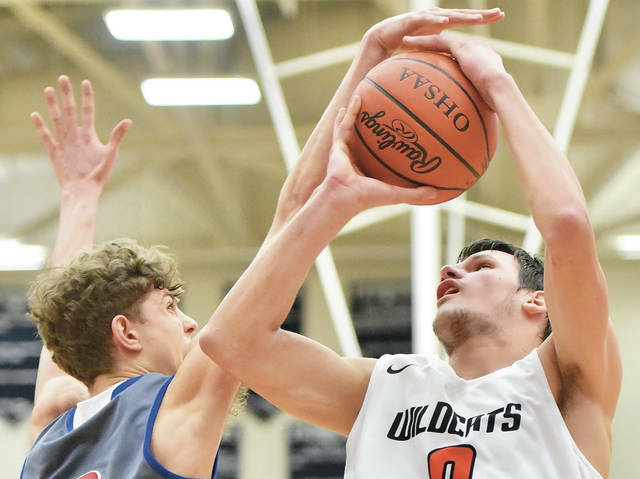 Jacob Salazar made a 3 with 4:27 left to cut the gap to 28-17, but the Wildcats scored just two points the rest of the quarter on a pair of free throws. The Knights’ hot shooting continued until halftime. Kalen Etzler made a three-point play with 1:11 left and made a 3 right before the buzzer to boost the halftime lead to 41-19. 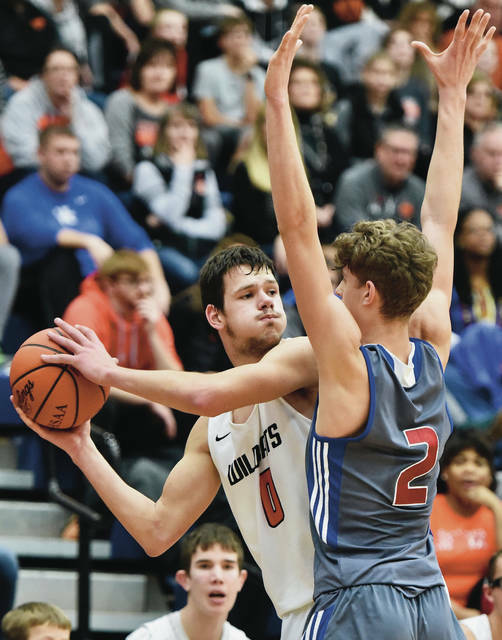 Minster resumes MAC play on Friday at home against New Bremen, and McClurg is hopeful the squad can re-start its hot stretch. Crestview shot 26 for 52 from the field. Minster shot 21 for 56 (37.5 percent) and outrebounded the Knights 35-31. Each team had six turnovers. Minster’s Cody Frericks looks to pass covered by Crestview’s Kalen Etzler during a game in Flyin’ to the Hoop on Sunday at Trent Arena in Kettering. https://www.sidneydailynews.com/wp-content/uploads/sites/47/2019/01/web1_6tu-1.jpgMinster’s Cody Frericks looks to pass covered by Crestview’s Kalen Etzler during a game in Flyin’ to the Hoop on Sunday at Trent Arena in Kettering. Minster’s Jarod Schulze shoots as Crestview’s Javin Etzler and Kalen Etzler defend during a game in Flyin’ to the Hoop on Sunday at Trent Arena in Kettering. https://www.sidneydailynews.com/wp-content/uploads/sites/47/2019/01/web1_athrs-1.jpgMinster’s Jarod Schulze shoots as Crestview’s Javin Etzler and Kalen Etzler defend during a game in Flyin’ to the Hoop on Sunday at Trent Arena in Kettering. Minster’s Mike Ketner shoots over Crestview’s Colton Lautzenheiser during a game in Flyin’ to the Hoop on Sunday at Trent Arena in Kettering. https://www.sidneydailynews.com/wp-content/uploads/sites/47/2019/01/web1_etyu-1.jpgMinster’s Mike Ketner shoots over Crestview’s Colton Lautzenheiser during a game in Flyin’ to the Hoop on Sunday at Trent Arena in Kettering. Minster’s Trent Roetgerman drives against Crestview’s Carson Kreischer during a game in Flyin’ to the Hoop on Sunday at Trent Arena in Kettering. Minster’s Jack Heitbrink shoots as Crestview’s Javin Etzler defends during a game in Flyin’ to the Hoop on Sunday at Trent Arena in Kettering. This entry was tagged basketball, boys basketball, Cody Frericks, Convoy, Convoy Crestview, Crestview, Dayton, Flyin, Flyin’ to the Hoop, Flying, Flying to the Hoop, high school, hoops, invitational, Jack Heitbrink, Jarod Schulze, javin Etzler, Kalen Etzler, Kettering, Michael McClurg, Mike Ketner, minster, ohio, result, score, Tournament, Trent Arena, Wade Sheets, who won, Wildcats. Bookmark the permalink.